So, it’s been a while since I’ve been able to slow down and post. As it is said, life is what happens regardless of you’r plans. lol. A couple of small boxes, showing the lid, and a shot of the side. I thought it would be neat to try and match the natural ring pattern. Cut theses from a scrap 2 X 12 pine board. I milled out the inside for the tops, and bottoms using pocketing. Then flipped them over to do the top of the lids. The first couple of trys I got my depth wrong. So, when milling the eagle and bass I ended up cutting through the lid. Hooray for trial and error. For the pocketing I used a .250 downcut end mill. For the eagle and bass I used a .250 ball mill (Carbide3D #202) for both roughing and finish pass. playing around with dyeing resin epoxy and using it for an inlay. 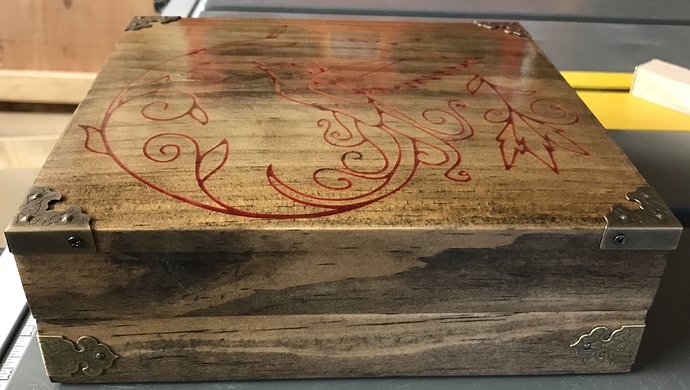 Then decided to make a box using this pattern. Again using some scrap lumber I had around the shop. Did this pretty much the same as the first two boxes for the inside of top and bottom. 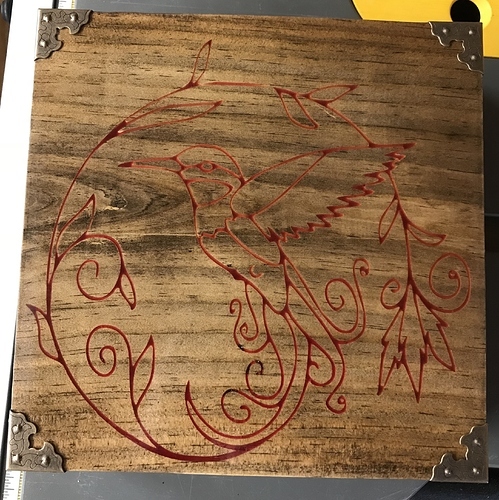 First step was the Vcarve for the inlay. I then removed it from the machine and and after mixing my epoxy and letting it setup I ran it though a thickness planer removing about a 32nd of an inch to get rid of excess epoxy and saving myself huge amount of time sanding lol. Then back on the machine, (flipped), to pocket for the lid and bottom. I also found some nifty little brass fixtures for the corners and sides on amazon and thought it would be neat. I used a Whiteside 60 degree V-bit (1540) for the v-carve, and .250 downcut end mill for the pocketing. This was just playing with V-carve inlay using poplar and cedar that I had left over from another project. This was actually my first attempt at doing a Vcarve inlay. Some areas I ended up losing some of the cedar while sanding. 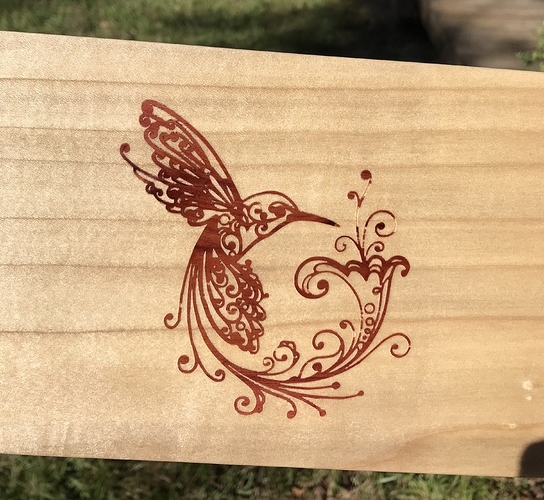 Also, maybe not the best idea for a first time Vcarve inlay. I might should have gone for something with a little less fine detail. lol. I used the Whiteside 60 degree V-bit (1540) for both male and female sides of the inlay. This was a stand to hold a lot of little bottles of paint for a friend of mine who builds a lot of models. For this we just picked up some poplar from a local hardware store. I cut the center slat to hold the paint bottles first. After measuring the bottles and deciding on depth, it was just an array of circles and pocketing. The lettering on the base (not the best pic, sorry) was V carved after staining and reads “Make it your own”. The sides were just some basic knot work V carved and the stain applied after the carving. Then some brad nails to hold it all together. It holds 105 bottles of paint. I used the .250 downcut end mill for the pocketing for the paint bottles, Whiteside 60 degree v-bit for the knot work design, and Whiteside 90 degree v-bit (1500) for the lettering on the base. Yeah, my work bench there is a bit of a mess, lol. These are some stylized butterflies (my wife likes them) that I cut for side panels on a box for my wife. The Paradise box tutorial from Vetric, made up the rest of the box. I again used the the Whiteside v-bit for this but can’t remember right now if it was the 60 or 90 degree that I used. Last, and probably least. lol. a couple of X-mas ornaments. This is two showing the front and back. These were made with red oak for some friends. Reclamed cedar reindeer inlay using V-carve inlay. I had a couple of voids show as the cedar chipped out a little. The other side just a snowflake using a 30 degree v-bit (engraving bit, I’m not really sure how I should refer to that one.lol.) I used V-carve desktop quick engrave for this side of these. This photo was a light sanding after pulling them off the machine. I didn’t paint of seal these two as they were last minute additions. I also didn’t save any photos of these finished with stain, paint, or sealant applied. For some fun, and humor, I also made a few of these for friends as well. Again these two are just showing front and back. Made with some scrap pine. I think I just used the V-carve quick engrave on these as well, only adjusting cut depth so I could use some spay can paint and sand off the overspray, then applied some stain. and sealed them. For both sets of the ornaments I did my engraving, flipped and engraved the other side. Pulled the off the machine bed, did any painting that was planed and sanded, then back on the machine to be cut out. this has been a really long post. lol. Sorry about that. I just really wanted to post this while I had some time. Oh, almost forgot. 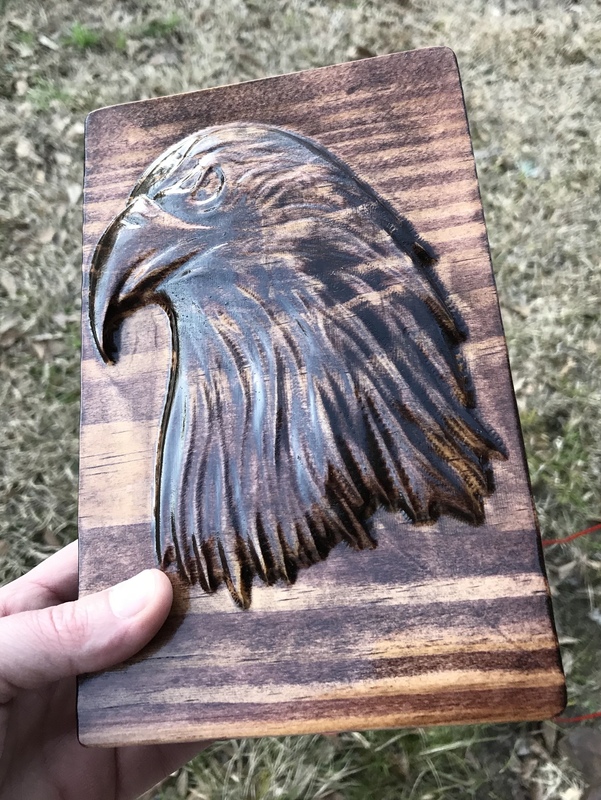 I used V-carve desktop for these projects. I had to come back and edit this as I forgot to also say I use Carbide Motion for running my machine. Hope all of you folks are doing well. I didn’t have any issues at all running this through mine. I use a bench top planer in my little shop and it had no problem running this though. The photo of the unfinished wood (pine) with the epoxy inlay is straight out of the planer without any sanding. I also checked my blades after I did this just to make sure there was no gumming or anything thing, and the blades were fine. I was using Devcon 5 minute epoxy and Rit liquid dye to color the epoxy. As an aside. Next time I will use a 30 minute epoxy so I have more time to work with this stuff. lol.